Below are some examples of how to personalize a unique engagement ring or wedding band. Chinese characters or Kanji's may convey your love through the use of one symbol. The two custom wedding bands on the left have the characters etched inside and outside the band. Shown on the very right is the character representing love. Please provide camera ready artwork (black and white image) for your unique symbol(s). Any symbol can be etched onto the outside or the inside of the band. Renderings are created before production to confirm size and placement. The background is sandblasted, so there is nice contrast between the symbol and the surface. Background of symbol can be left matte, or can be darkened. Any symbol can be represented by an etched background. When using this technique, raised rails are recommended, as shown. The background is sandblasted, so there is nice contrast for the symbol. Background can be left matte, or can be darkened. For custom symbols, a rendering will be created for your approval. For a completely three dimensional result, the ring or jewelry is created out of the symbol. This may take many different forms. It can be labor intensive and results in a spectacular miniature sculpture. Customize your ring with the constellation representing your astrological sign! These celestial wedding bands and engagement ring have sparkling gemstones in place of stars. Orion, Pleiades and Taurus are represented by flush-set fancy color diamonds and sapphires. Please provide a graphic showing the constellation you would like to show on your constellation wedding ring! Another personal symbol you may like in your ring is the family crest. On the left is a coat of arms in 18K gold with a ruby. Create your own Men's Crest Ring! On the right is a Japanese family crest in a Platinum mokume gane wedding band. Please provide camera ready artwork (black and white image). Tattoo graphics often translate well into jewelry. 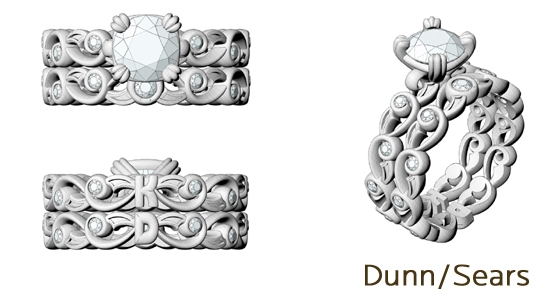 These wedding bands were based on images clients sent us of their tattoos. Please provide camera ready artwork (black and white image). If that is not available, you can take advantage of our graphic design services. Is there a tune that is meaningful to you and your loved one? Are you musically-inclined? Have a music staff sampling your favorite sheet music etched into a custom ring. Start customizing your own Musical Symbol Wedding Ring! Please provide the graphic of the musical phrase you would like in your wedding ring. This unique ring set features a mountain symbol on both rings. The snow-capped mountain is etched inside the band of the engagement ring, and inlaid as two metals in the men's wedding band. Please provide camera ready artwork (black and white image) for your unique symbol ring. You may also have initials handcrafted as a sculptural part of the band. The palm-side of these Delicate Leaf Engagement Rings have initials integrated into the band. Please provide camera ready artwork (black and white image) of the letter or letters you would like incorporated into your ring. Text may serve as the focus of the ring. Pictured are the available fonts for designing your own word ring. Start designing your own word wedding band!